Thank you poems to teachers - your words of thanks will be so appreciated! 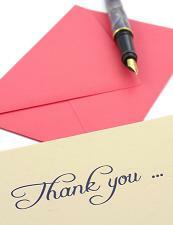 A lovely hand written card expressing your gratitude will be valued and cherished. To make a difference in a student's life is a remarkable gift - don't assume that your teacher realizes the impact they made in your life - rather tell them. Finally - you get your chance to have the last word - make it special! My thanks to you - making me look straight ahead! Know that the difference you made, in my life will feature! Free thank you poems - you write them,; they'll read them...I guarantee you -; your teacher will love them!